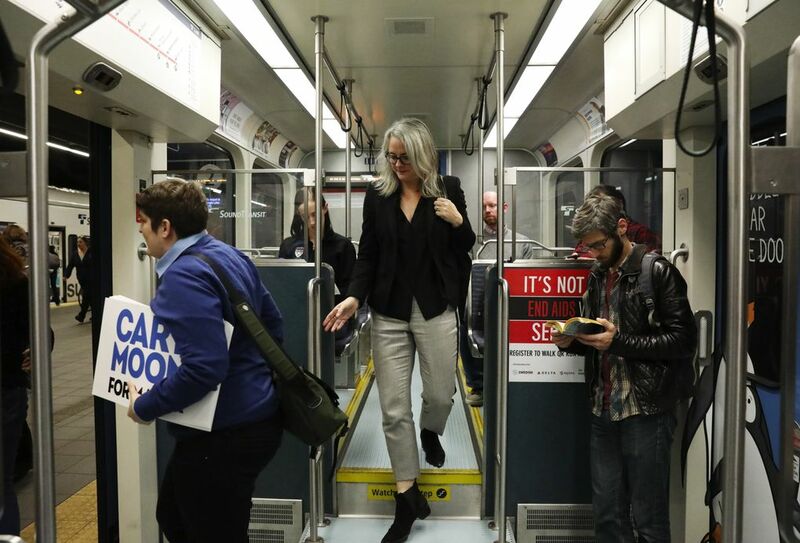 Seattle mayoral candidate Cary Moon has won praise as an articulate urbanist and activist who crusaded against Seattle’s waterfront tunnel. But a look at her professional and civic life shows sparse management experience. From the time she moved to Seattle two decades ago, Cary Moon has devoted herself to re-imagining the cityscape — often focusing on the Elliott Bay waterfront she can see from her downtown penthouse. 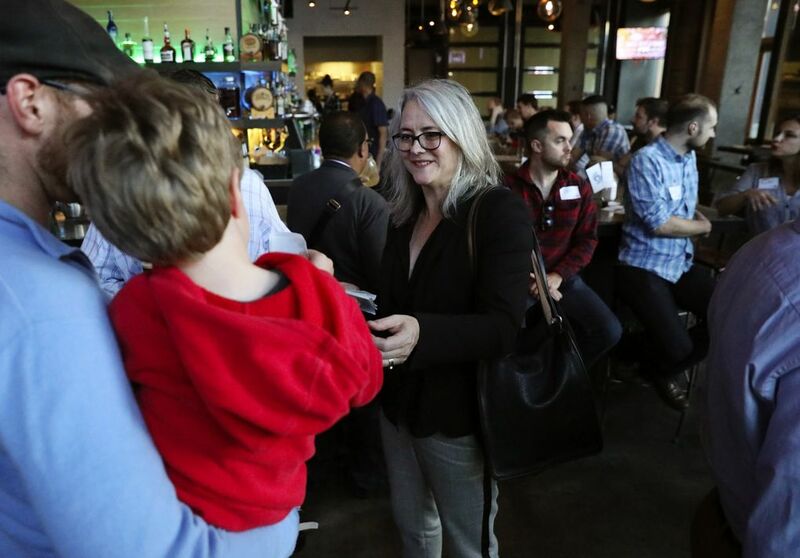 As she campaigns for mayor in the Nov. 7 election, Moon has won praise as a progressive urbanist with expertise in zoning, urban design and transportation issues facing the city. But Moon has struggled to show she has the management experience or concrete accomplishments to prepare her to lead a $5.3 billion, 12,000-employee city bureaucracy. Educated as an engineer and landscape architect, Moon, 54, is best known as co-founder of the People’s Waterfront Coalition, the scrappy activist group that unsuccessfully fought the deep-bore tunnel now under construction to replace the Alaskan Way Viaduct. Beyond that she worked as a self-employed urban designer who cowrote a neighborhood plan for Pioneer Square in 1998 and served on the city’s design commission. For management experience, she cites three years in the early 1990s helping to run her father’s manufacturing firm. When making political donations in recent years, Moon frequently has listed her occupation as unemployed or retired. At a forum last month, she said she’s been on “sabbatical” from paid work, studying issues such as racial inequity and housing affordability. For her accomplishments, she ticks off a list heavy on intangibles, with terms like guiding, helping, steering, and building public will. Moon calls the amalgamation — exemplified by her efforts to sway the future of Seattle’s waterfront — “the mushy work” of civic leadership. But critics argue Moon’s résumé is too thin and contend she’s exaggerated her accomplishments. Royer, who served with Moon on a key city waterfront committee, said she made a valuable contribution. But, he added, Moon takes too much credit for shaping the waterfront’s future. Moon was born Carol Consuela Moon in Indiana in June 1963, one of seven children of a homemaker, Connie Moon, and an engineer, William Moon, who bought a manufacturing company in the 1970s and moved it to Buchanan, Michigan. The firm, Pro-Tech Respirators, prospered, growing to 112 employees at its peak in 1993, according to Moon’s older brother, Michael Moon, who ran the company’s engineering and marketing departments for four years when his sister worked there as operations manager. 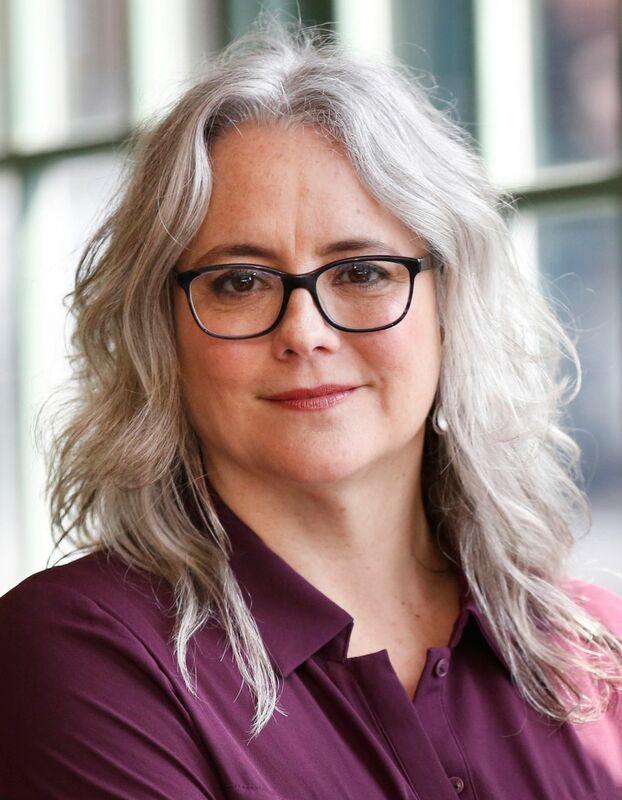 Cary Moon has compared her management responsibilities at the company with Durkan’s running of the U.S. Attorney’s Office for the Western District of Washington from 2009 to 2014. Moon earned a bachelor’s degree in operations engineering from the University of Michigan, then spent two years working for the U.S. Department of Labor during the Reagan administration, followed by several years as an operations engineer for a Redmond microelectronics firm. She returned to Michigan in 1991 and ran the operations end of her family business for three years, directly supervising as many as 80 employees who assembled respirators and other safety equipment on the factory floor, her brother said. Michael Moon remembers his sister revamping Pro-Tech’s manufacturing, inventory and delivery systems so the company could ship orders the same day they were placed. By that time, her father was spending winters golfing in South Carolina, and Moon says she ran the company in his absence. Employees recalled Pro-Tech offered flex time, and it awarded bonuses and free lunches to workers who hit production and attendance goals. Brenda Payton, a 20-year Pro-Tech employee, described Moon as a down-to-earth manager who never pulled rank. “She worked with all of the employees, and she learned their jobs and helped them work smarter, not harder,” she said. Moon said she started a stock plan at the firm that handed over a third of the company to employees. “I knew our company’s success depended on respecting and fully valuing the expertise and hard work of our employees. So I decided to make our 100 employees part owners of the company,” she said in a recent news release. Ruszkowski, though, credited Moon’s father with initiating the employee-ownership plan. “When Bill (Moon’s father) decided to get out of the business, he did set up an (Employee Stock Ownership Plan),’’ he said. Michael Moon said his father began the worker-ownership plan, noting it allowed the company to reward longtime employees and take advantage of federal tax benefits. Pro-Tech was sold in March 1995 for $6.8 million, according to a filing with the US Securities and Exchange Commission. 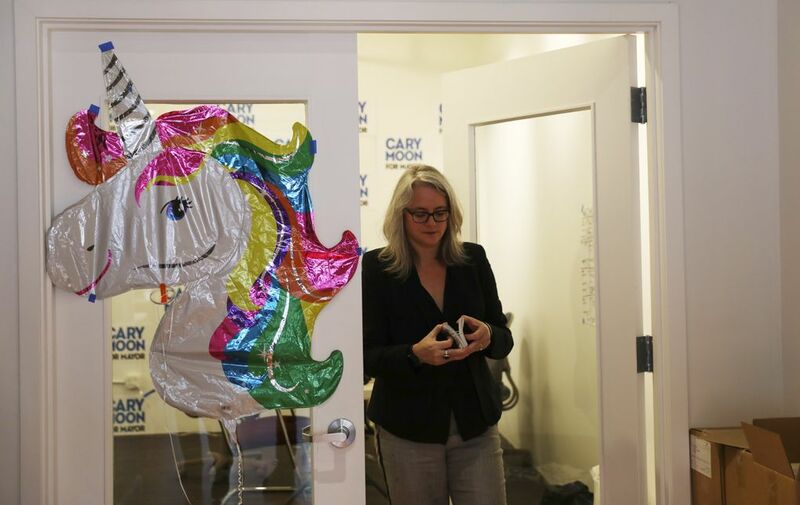 During her campaign, Cary Moon has said, “Everybody got a check for $50,000, $60,000. Whatever their share of the company was” when the company was sold. The Times could not confirm that figure or reconcile the math with the employee count and amount of the sale. Her campaign later clarified that employees received differing amounts based on their salaries. On her LinkedIn profile, Moon characterized the production bonuses as profit-sharing and referred to an award from the Michigan Chamber of Commerce that could not be confirmed by The Times. The campaign took down Moon’s LinkedIn page a few weeks ago, saying it was too confusing. Moon and her brother both said the family felt betrayed when the French firm that bought the company shut down the Michigan factory within the year, breaking a pledge to keep it open. Moon married in 1992, and two years later she left the family business to earn a master’s in landscape architecture with a certificate in urban design from the University of Pennsylvania. After graduation in 1997, she and her husband moved to Seattle’s Pioneer Square. Moon started her own company, Landscape Agents, and befriended her landlord, Renee Tanner, who had a contract with the city to write a neighborhood plan for Pioneer Square. Tanner hired Moon as a subcontractor, and they began working with a neighborhood group, city staff and a planning commission to craft what would become the Pioneer Square Neighborhood Plan. Published in 1998, the plan urged 1,736 more middle- and high-end apartments in the historic neighborhood, and 344 “low-middle” units. Citing the hundreds of shelter beds already in Pioneer Square, the plan recommended no new low-income housing units or transitional housing. “There was an overconcentration of social services and low-income housing that needed to be balanced,” Moon explained. The plan called for a downtown waterfront park, an idea Moon would spend years working to make happen while creating a name for herself as a political activist. A year after finishing the Pioneer Square plan, Moon and her husband bought a condo in a building next to the Alaskan Way Viaduct. Moon says she worked part time on minor jobs through her design company, devoting most of her time to raising her two young children, and to civic affairs, including a seat on the city’s design commission, an advisory group that reviews public-works projects and others receiving city funding. State records show Moon’s company, Landscape Agents, has been inactive since 2006. When Moon and her husband divorced in 2005, she bought another condo in the same complex from a woman who was facing foreclosure after falling six months behind on her mortgage payments. Moon said she was facing her own financial struggles at the time, and she tapped into her savings for a while to pay bills. Around the same time, Moon got deeply involved in designing the waterfront, co-founding the People’s Waterfront Coalition with Julie Parrett, a friend from graduate school. Her campaign said she was paid $40,000 to $60,000 a year as the group’s director from 2005 to 2009. The small nonprofit pushed for a viaduct-free waterfront, producing eye-catching designs of a grassy park with a shoreline boulevard to replace the elevated state highway damaged in the 2001 Nisqually earthquake. 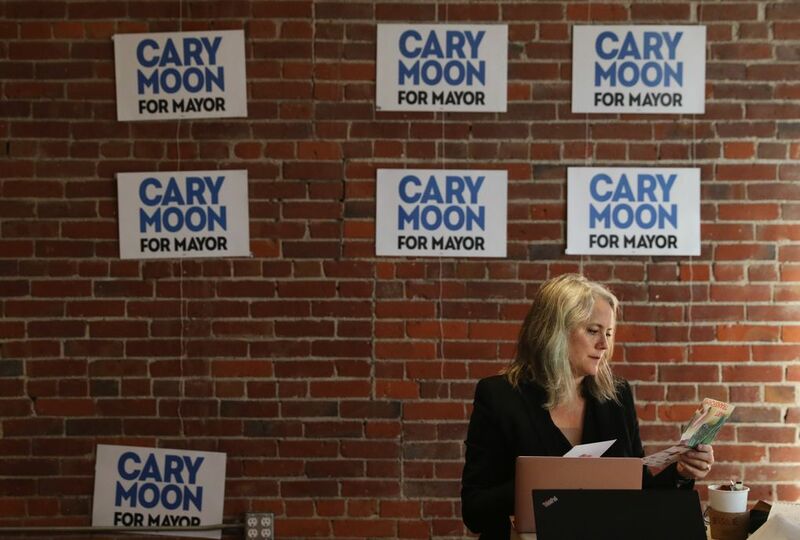 Moon and her supporters say she helped galvanize public support for a walkable park and boulevard on the waterfront after the viaduct is demolished. Along with former Mayor Mike McGinn, Moon emerged as a leading opponent of the deep-bore tunnel. 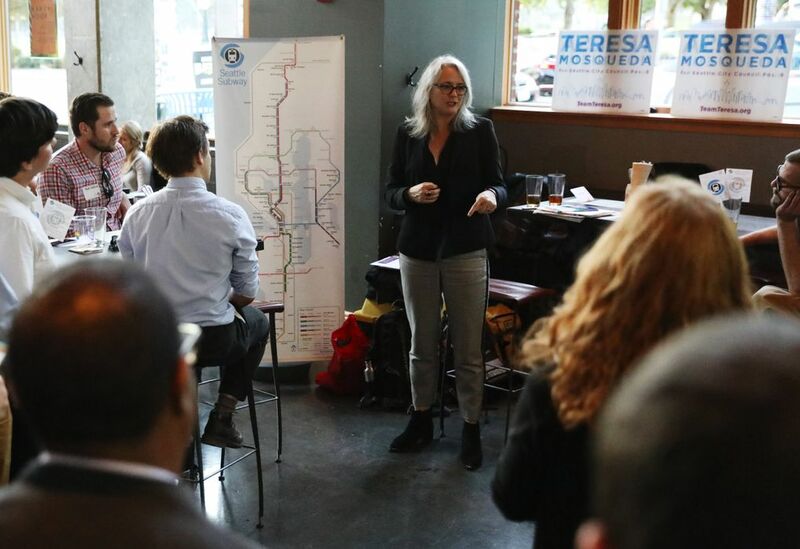 She and others demanded a so-called “surface-transit” option, which they said would absorb viaduct traffic by expanding bus service and rerouting traffic to Interstate 5 and downtown streets. That option — cheaper than a tunnel — was for a time considered a leading possibility. But business and port interests opposed it, and some experts said it would worsen traffic and harm businesses. After years of political debate, state and city leaders rejected that option in favor of the tunnel. “She was a visionary,” said Michael Karp, the president of A World Institute for a Sustainable Humanity (AWISH), a Lopez Island-based nonprofit that acted as a fiscal sponsor, passing through tax-exempt donations to Moon’s coalition. Moon now lives in a $1.5 million penthouse condo she bought in 2014 with her second husband, architect Mark Reddington, who also served on the city’s waterfront committee. Moon served on the city’s 45-member Central Waterfront Committee from 2010 to 2014, sitting on the design-review subgroup. In that role, “She asked a lot of hard questions on the street width and design. She challenged us to make the road as human-scaled as it could be,” said Marshall Foster, the city’s waterfront director. But some prominent leaders involved in the waterfront work — who are supporting Durkan for mayor — contend Moon is overstating her influence in shaping the future waterfront. “In my humble opinion, she is not giving credit to others that did more,” said City Councilmember Sally Bagshaw, who previously worked on waterfront issues with the civic group Allied Arts. When the waterfront group was reorganized in 2014, Moon was not appointed to the smaller successor committee. She makes no apologies for critiquing the future waterfront’s design. Moon is counting that her vision and activism will help persuade voters to give her a new unambiguous title: mayor.